Here’s how to get a jump-start on creating a system to organize your bills, statements, policies, and other financial paperwork. Financial organization is a cornerstone of a healthy financial life. At the most basic level, financial organization saves time and money because it aids in paying bills on time, finding needed documents during tax season, providing proof of payment, disputing credit cards or billing errors, and avoiding the stress of dealing with piles of unorganized bills and paperwork. It also sets the stage for better decisions on investments, budgeting, debt, and investment planning. Financial organization helps your working relationship with your financial advisor because there will be less time spent looking for paperwork and more clarity around the overall financial situation, leading to more informed decisions about your investments and financial plans. While having a system to organize financial paperwork is important, it is not so important which system is followed but that a system exists. In most cases, a combination of electronic and paper filing systems will do the trick. 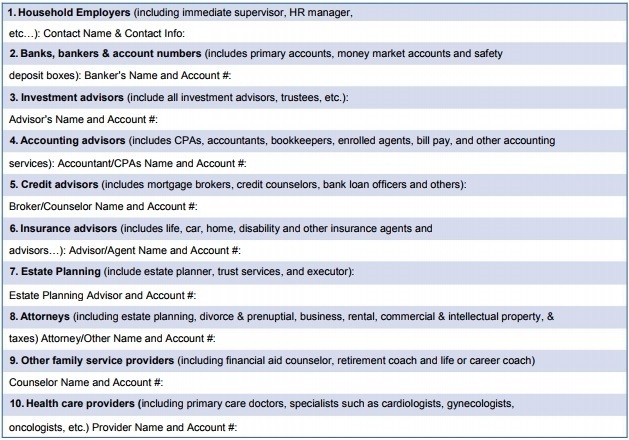 Bills, statements, policies, and other documents that are delivered online can be stored and backed up on a computer hard drive or through online banking websites, third party bill pay, and website document storage platforms. 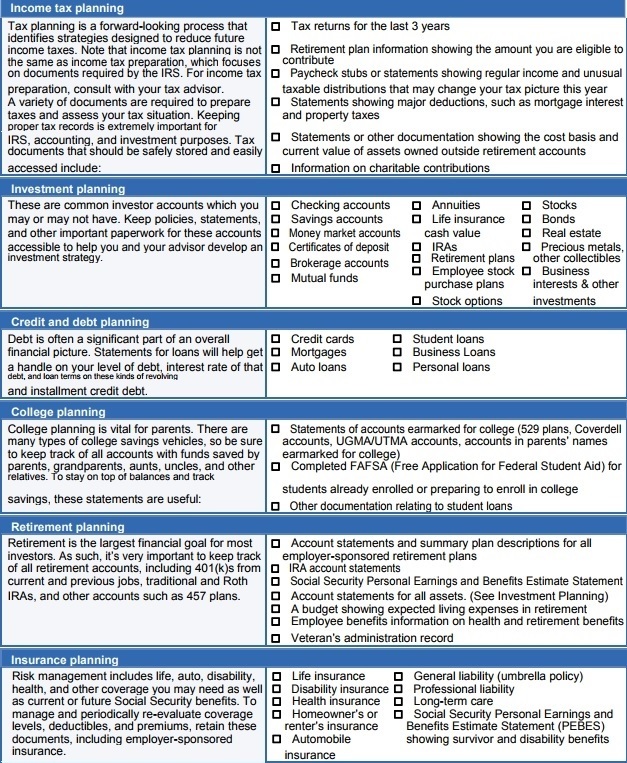 Some websites offer budgeting and spending information and advice. For couples, clearly establishing responsibilities for financial matters is an important priority. If one spouse manages the finances, the other spouse should be informed about what is going on financially, where important documents are stored, and the passwords for all online accounts. What documents to keep and what to toss is another important part of becoming better organized. The IRS recommends retaining tax returns and any documents that support tax returns for seven years. Other documents such as paper bank statements, investment account statements, and credit card statements can be shredded after a year, especially if they can be accessed online in the future if necessary. 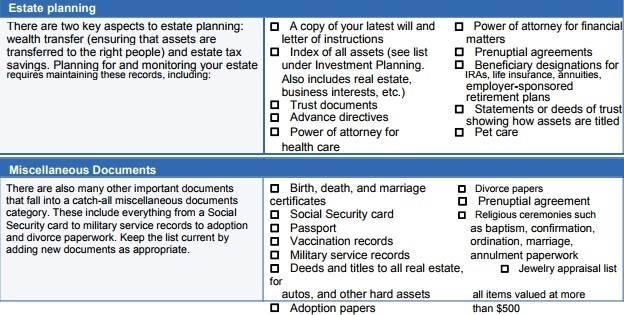 Financial paperwork generally falls into the following categories: investments, taxes, credit cards and loans, college savings, retirement savings, insurance, and estate planning. Let’s take a look at what documents you need to keep on hand in these areas. From employers to bankers to insurance agents, most of us have a large and constantly changing list of trusted advisors. It's important to update this at least once a year as this information usually changes often. In an emergency, family members need to know who to contact for important information about insurance policies, account balances, etc. 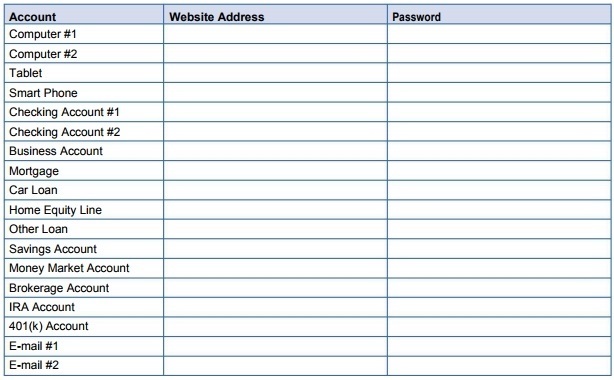 Make a list of all the password and personal identification numbers (PINs) that are important to your financial affairs. Keep it with your important financial documents and update it once a year. Elaine Floyd, CFP®, is the Director of Retirement and Life Planning at Horsesmouth, where she focuses on helping people understand the practical and technical aspects of retirement income planning. Horsesmouth is an independent organization providing unique, unbiased insight into critical issues facing financial advisors and their clients. Horsesmouth was founded in 1996 and is located in New York City. Amy E. Buttell is an Erie, PA based freelancer writer. Her articles have appeared in leading publications including The Journal of Financial Planning, The Investment Professional, AARP: The Magazine and Consumer’s Digest. Neither Amy Buttell nor Horsesmouth is affiliated with FSC Securities Corporation.